A futuristic action film sold primarily on its stunts; more specifically, the French free-running art form known as Parkour, co-created by the film’s star, David Belle. He leaps majestically over iconic landmarks, buildings and street scenes in sequences of high-octane, gymnastic self-expression. The chase scenes are channelled through a crime story centred around gang culture among the urban decay of Paris’ B13 region, noted for its lawlessness and poverty. 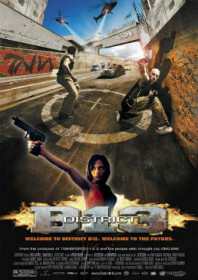 Belle plays a tattooed thug escaping from prison to protect his kidnapped sister, teaming up with Cyril Raffaelli’s hard-bitten undercover cop to help take out the baddies. Nuclear detonators are strapped to the quarantined zone to add further tension to the story, as the two buddies find themselves in a race against time. The Parkour sequences are wonderful and reminiscent of Tony Jaa‘s work in Ong-Bak; athletic, original, and refreshingly free from wires or computer effects. But the rest of the film isn’t quite as engaging as Luc Besson‘s previous creative endeavours, like The Fifth Element, Leon or The Transporter. AKA: B-13; Banlieue 13; District B13; 13th District.